GARTH ENNIS returns to the horrifyingly brutal world he created with a story that fans have waited over five years for! The Crossed outbreak created a miserable grueling world of monsters that dash out all hope of survival and ensures a terrifying end to everything in their path. For the first time, master storyteller Garth Ennis takes you back to the early days of outbreak and delivers the unexpected - a patient zero tale. With the outbreak spreading like wildfire across the globe, a group of soldiers attempt to piece together how the disease spread so quickly and to reverse the horror they see taking place in the streets. And as they struggle to catch up with events, a fleet of nuclear-armed planes carry the extinction of the human race as they race towards America, with only one British flight crew to stand in their way. No one can deliver this level of poignant horror like Garth Ennis. In a world where there is no help and there is no hope...there is only the Crossed. 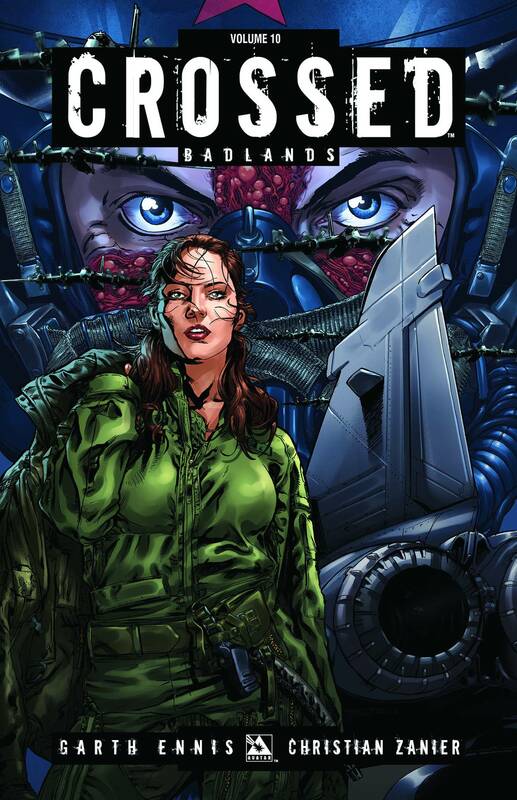 Crossed Vol 10 collects the story Thin Red Line from issues 50 - 56 of the ongoing Crossed: Badlands series.